For the record, walking around looking like you're being eaten by a flower is not -- repeat, not -- intimidating to your opponents. Anything that makes you look like something The Joker would shrink and stick in his lapel should, as a rule, be avoided when putting together your costume. Whenever you walk out of the house and people start pointing and/or laughing, you should probably turn back around and slip into something fishnet just to be safe. In other words, that headpiece is appallingly bad. The rest of the outfit is standard super-fantasy-villain fare and perfectly serviceable, and I by all means encourage more leggy females to saunter around in hot Robin half-boots and two dishrags joined by a bikini top, but anyone wearing anything on their head that makes me want to pluck them ought to be hung. Finally, I get that all of the Amethyst nobles are named after particular gems, but that makes me wonder where Fire Jade is hiding her fire jade and why she went for the flower angle in the first place. And why there's no fire on her. Anyway, I'm pretty sure I'd like to lead the expedition to discover the location of that fire jade on her person, although we'd probably end up as just fronds and I'd have to leaf her alone, back-petaling away like made to try and stem the flow of derision and insults and things in that vein. Let’s not be too harsh with Fire Jade; after all, she IS showing some T&A. Maybe she got lost on her way to Plantworld. BREEEP! BREEEP! Bad Pun Alert! Boot to the head for Jeff Hebert! BTW, doesn’t she look like Daffy Duck after he got atacked by a pencil? Someone’s never heard of the venus fly trap apparently. I believe there are other carnivorous plants as well. While I agree that helmet looks pretty stupid, plants can be scary. No one ever really thinks about them as they walk through the woods. How many times has someone died because they ate a plant they shouldnt have or got stuck by a poisonous plant. And if they had a will of their own or someone to control them (like Poison Ivy)….. And let’s not forget The Happening. @J: Yeah, and that green daisy around her face is a Venus fly trap. Right. @Jose: Great comparison! That’s exactly what she looks like! Note that at no point do you want anyone pointing at your costume and comparing it in any way to a duck. Or daffy things. The costume, if it were another color, would be great! What did she make it out of – – old army blankets!? I think it should have been something like a lime or neon green. The name, however, is cool. I almost recognize the style but I can’t quite come up with the name of the artist. Anybody know where she’s from? 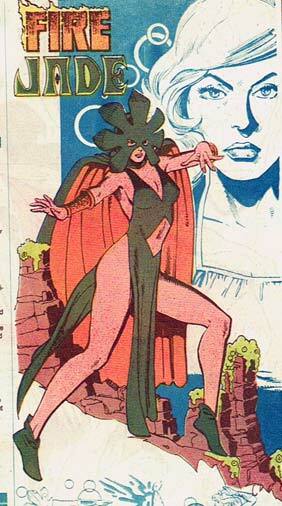 It sort of looks like it might’ve been drawn by Mike Grell. A P.S. About the costume. After another look, that flower has got to go! And change the olive drab to, say, lime green and the “red” to Navy orange. Then you could call her Neon Jade!